What do you say if a student asks you this question: "Particle physicists study particles—but what's a particle?" It's not a trivial question, is it? The existence of particle species with well-defined attributes like mass, charge, and spin was discovered, not dreamed up. What a particle is can't really be separated from the experimental methods used to detect and study particles. Particle physics is actually an ideal way to introduce numerous concepts of modern physics (relativity and quantum physics) without having to go through the full mathematical development of the theory, or even using calculus. First of all, the events are visible (at least the charged-particle parts) and every particle decay event—such as those seen in the OnScreen Particle Physics™ chamber—are quantum events. Furthermore, the relativistic mass/energy/momentum relations are just everyday toolbox items for particle physics data analysis. And nothing beyond algebra is required to use them. "What a terrific program! An excellent tool for teaching conservation laws. Bravo! Most programs I've tried don't quite live up to their billing. This one does. Thanks for a program carefully crafted. I look forward to many years of using it." We have observed that students take pleasure in carrying out particle identifications using the famous E=mc2 equation. The simulations are deep. Every student can get something out of them, and the better, more motivated students can get a lot out of them. OnScreen Particle Physics gives you realistic particle physics data—tracks of charged particles in a 3D detection chamber, not simulations of theory. Think of it as getting your own particle physics facility for $24.99. "Group activities using OnScreen Particle Physics—interpretation of decay signatures or measuring a particle's mass—are fascinating for the students. The program is easy to use and—because it simulates ideal conditions—it is easy for the students to learn the fundamental things." Take a look at some of the screen shots. 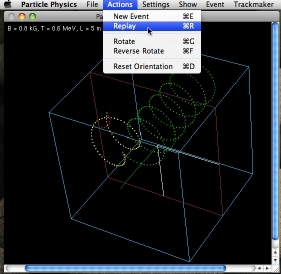 Check out the detection chamber, the projection view, the chamber controls, the on-screen help, and the Trackmaker simulation of a charged particle moving in a magnetic field. But keep in mind that they only give you a rough idea of what you can do with the program, because the real thing moves! With the real program you can rotate the 3D chamber to see events from different perspectives, and you can replay an event in slow motion, so that it unfolds clearly in both time and space. A particle is injected; it decays into other particles, and the sequence is as clear as can be. Each event is different, randomly generated in accordance with the real physics. OnScreen Particle Physics actually lets you measure particle tracks with an on-screen tape measure and gives you the (relativistically correct) algebraic equations needed to turn a radius of curvature measurement into a momentum measurement and then into a mass determination. This is exactly what real particle physicists do. You and your students get the equivalent of practical experience with the techniques and principles of particle physics. Thus you can teach HOW we know as well as what we know. Detailed examples of particle data analyses are presented in the Instructor's Guide. Join physics teachers at MIT, Ohio St., Columbia, Fermilab, Indiana U., CERN, N. Carolina St., Brown, Lawrence Berkeley Lab, Stanford Linear Accelerator Center, Syracuse, Michigan St., SUNY, Arizona St., Northwestern, Auburn, Oklahoma U., Vanderbilt, Florida St., LSU, Purdue, Georgia Tech, SMU, William & Mary, and Kansas St.; at the Universities of California, Michigan, Chicago, Colorado, W. Virginia, New Mexico, Mississippi, Florida, Arizona, Maine, and Massachusetts; and at numerous other universities, colleges, and high schools across the country that already are using OnScreen Particle Physics to bring their students the excitement of modern physics! Only you can decide how well OnScreen Particle Physics works for you and your students. Order now and find out the easy way. Our ironclad, 60-day, money-back guarantee means there is absolutely no risk.